Thank you for your support in 2018 - Here's to an exciting 2019! KEIZER, Ore-- The Volcanoes offense was on a tear tonight as they racked up 16 hits and 15 total runs in a 15-5 rout of the Eugene Emeralds. The team came into the game one game behind the Emeralds for the second place and playoff spot in the Northwest League (NWL) South Division. They were able to tie that back up with Thursday's win. Trent Toplikar got the start for the Volcanoes and went 4 IP and only allowed 1 earned run. 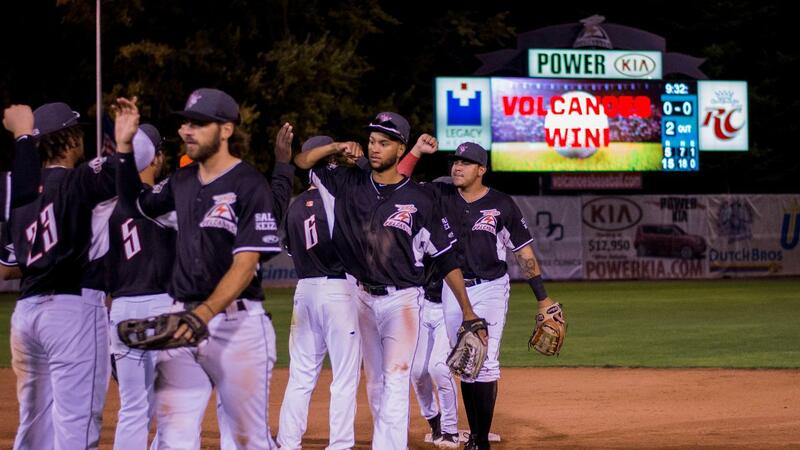 For the second night in a row the entire starting lineup for the Volcanoes got hits. Six of those starters had multi-hit games and while two had 3+ hits in the game. Standouts tonight were basically the whole lineup, but Diego Rincones was the star. He finished the game with a line of 4/5, 2 R, 2B, 3 RBI and was all over the place tonight. The homeruns tonight were hit by Joey Bart (12), David Villar (12), Aaron Bond (11). Villar would finish the night with 3 total hits including the HR and 2 total RBIs. Seven of the nine starters also had RBIs with 5 of those having 2+, and 2 of them having 3. It was a standout night for the offense who really needed to get things going to start this playoff push. Blake Rivera relieved Toplikar and threw three total innings while giving up 4ER that were all on a grand slam from Brennon Kaleiwahea. He would give way to Miguel Figueroa in the eighth and he threw two scoreless while striking out two. Figueroa wound up with the win in this one. The Volcanoes will be back Friday night to face the Emeralds again in a crucial series ending matchup with real playoff implications. Seth Corry is the probable starter for your Volcanoes.